The chief had ordered that I stay in the hut where they bury rejected children alive, those with any kind of disability, not important enough to be buried in the cemetery. The tribe believed the hut was full of evil spirits that would kill me. As I slept over the bodies of rejected babies that night, something extraordinary began. The Lord commenced to break the power of fear, suffering, and injustice that infanticide so darkly represented. When Marcia dos Santos came to faith as a teenage girl, she heard a clear call to commit her life to serving indigenous peoples. The call also came to Marcia's future husband, Edson Suzuki, who likewise realized the importance of helping Indians with health care in order to combat the Amazonian tribal practices of infanticide and suicide. What began as a simple walk of obedience has led to years of ministry and international and governmental efforts creating new laws protecting at-risk indigenous children. 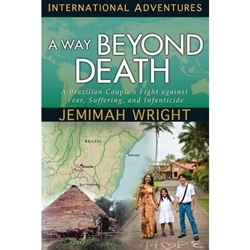 The Suzuki's powerful story, as told to Jemimah Wright, is a picture of God's redemptive hand that offers compassion and healing to the outcast and rejected. "This story will lead you not only through a fascinating life experience, but also to the Lord's heart. It shows how the power of God can act in any environment, bringing light and hope."